Check out the resources below for ways to deepen learning. If you have questions, please feel free to contact the Education Team. Classroom resource boxes may be borrowed by K-12 teachers. Some boxes require training before use. Please contact us for more information. Grade 5, Grade 8, and high school U.S. History - Colonial America through Reconstruction: Provides introduction and contextualization for the study of civil rights and civil rights-related topics. Gives students opportunities to explore reproduction objects representing different groups' civil rights over time. Big Questions: What are civil rights? Who is impacted by civil rights, how, and why? How does the thread of civil rights efforts run throughout history? Kit includes objects, lesson plan, and student activity sheet. Time required: 1 or 2 class periods. We are pleased to offer teaching materials designed to complement resources at the MSU Museum. Whether or not you can visit the Museum with your students, these materials provide ways to experience the resources in your classroom. Click on your selection below to access materials. Want to learn more about how you can use museum resources with your students? Read any of our "Museum Teaching 101" pages below. If you have questions or would like support for museum-based teaching, please contact the Education Team. We are happy to work with you. The MSU Museum offers online access to selected internal collections resources. We also are pleased to share collections and informational databases from other institutions. The Michigan State University Museum is the first collection holding unit established on campus. It has comprehensive natural science collections and the university's most extensive and diverse cultural collections. Michigan State University Museum’s collections are the tangible evidence of the diversity of nature and human cultures throughout the world and through time. are used for research, education, exhibition, outreach and engagement projects. 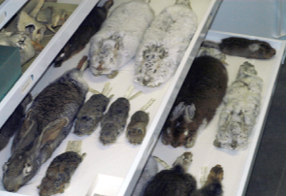 The Museum preserves, protects, and cares for nearly one million natural science specimens and cultural artifacts. Researchers, educators, students, artists, and community members use the collections to create new knowledge, to be inspired, and to spark others’ curiosity and imagination. The collections are available for on-site research and teaching by appointment only. To schedule an appointment in the Cultural Collections, contact Lynne Swanson, Collection Manager for Cultural Collections by phone at 517.355.3304 or by email at swansonl@msu.edu. To schedule an appointment in the Vertebrate Collections, contact Laura Abraczinskas, Collections Manager for Vertebrate Collections, by phone at 517.355.1290 or by email at abraczi1@msu.edu. Virtually everyone who lives in, or even just passes through, the Great State of Michigan, will come in contact with wild animals and other natural wonders. This website will, we hope, be a helpful resource for investigating our native (and sometimes non-native) wildlife and other natural objects and for helping to solve problems when people and wild animals come into conflict. Of course, we can't possibly have the answers to all the possible questions on Michigan natural history and wildlife that might arise , but when we're stumped we can usually point you towards other resources that may help solve the problem. Museums are the perfect place for student inquiry! Do you want to get your students more engaged in active, inquiry-based learning? Museums offer many different types of resources that may be used in multiple ways to support inquiry-oriented instruction. Using museum resources for inquiry can hep you broaden students' experiences with sources and promote deeper student interest in social studies, science, and other content areas. But what are these resources? How can you construct inquiry-based activities using these resources? A good place to start is with the learning goals you have for your students. Determine the curricular area(s) where what you are designing meets a need. Your goals might include engaging students in historical or scientific inquiry, exploring ways for students with different abilities to participate in inquiry-oriented activities, or increasing student interest. Then think about the questions you and your students might ask. Leave room for your students to work with you to develop good questions that may be investigated using a variety of sources. As your questions evolve, so will your potential collective ideas about the types of sources that will help answer those questions. What Resources Do Museums Offer? When people think about museums, the first thing that usually comes to mind is objects. Many people don't realize the breadth of things that museums offer besides objects that you can use for historical inquiry. Things: Artifacts/objects (things made by humans), specimens (things found in nature), and documentary records about objects and specimens (such as where an object came from or related research). "Things" include more than what you might expect: non-tangible material culture resources (including music and dance), oral accounts and other documentary evidence (audio and video), works of art (drawings, paintings, and other types), buildings, and landscapes. These resources may be useful as primary or secondary sources. Available in museum or via Internet. Exhibits: Designed displays created to showcase things related to a particular topic or theme. People often see exhibits as just a series of objects or a story/narrative, without critically engaging with what they are experiencing. The curators who develop exhibits present an argument through the presentation of ideas and objects. This argument is presented through the authoritative "voice" of museum text and labels - often called the curatorial voice. Visitors may analyze this voice as a secondary source. Available in museum or via Internet. Experts: Curators, collections managers, museum educators, and others are available to answer your questions, for example, students interviewing an expert for content information or tips about how to use resources. Available in person or via phone, email, chat, or video conference. Museums provide physical spaces and resources that encourage learners to engage in exploration, hands-on investigation, discovery, observation, and critical thinking: all activities that align with participatory pedagogies, including inquiry-based. Presenting the museum to your students as a "laboratory" or "field study" site offers a different type of experience than a traditional field trip where students visit the museum as a whole. You can use the museum as a place to engage with sources for inquiry, where students "capture" evidence and take it back to the classroom: inquiry notebooks, data sheets, journals, photographs they take, and more. Possibilities exist for using any type of museum resources that align with the historical questions you are investigating. Contact the MSU Museum Education Team for support in designing your students' learning experience! There is a range of ways that visitors - especially teacher visitors - can design a museum experience. Let's look at five different models of museum use. Although the term "field trip" had has different meanings over time, it is defined here as a visit to a museum, often as a school group, usually with the goal of experiencing the museum as a whole for the purpose of student learning and enrichment. Example: Ms. Kasper's sixth-grade class visits the Detroit Institute of the Arts, and students tour the galleries with their chaperones. 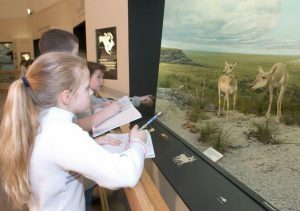 A museum visit for the purpose of engaging in pre-determined academic inquiry activity, using the museum as a source for primary sources or a site for investigation. Example: Ms. Donovan's second-grade class visits a local history museum to find objects, images, and texts to use as primary sources for their local community research. They take field notes and interview a historian. A museum visit for the purpose of fostering in students individual interest development, individual knowledge building in a certain topic, inspiration for future projects, or empathy development. Example: Ms. Rodriquez's fifth-grade science class visits a science center to use hands-on activities that teach the principles of simple machines. Students choose to do whatever topic-related activities interest them. Teacher or student use of museum resources from across the globe available via Internet. Much of what happens in the "in person" models may be achieved online. Example: Mr. Chen's twelfth-grade government class investigates historic Supreme Court decisions using an online exhibit on the Smithsonian Institution's website. The students analyze documents in groups. A museum visit for the purpose of engaging in a museum-directed activity, such as a curator talk or learning lab. Example: Mr. Christopher's ninth-grade English class visits the historic site, which was home to an author they are reading about in class. The students participate in an on-site discussion with a scholar. It also is possible for teachers to BLEND these models when visiting a museum! 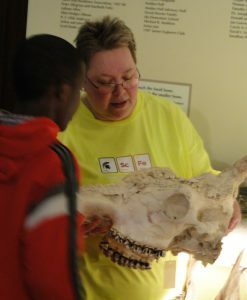 How do you want to use the MSU Museum with your students? What are some different ways we can look at objects? Materiality: Material objects include items with physical substance. They are primarily shaped or produced by human action, though objects created by nature can also play an important role in the history of human societies" (Waugh, n.d.). Identity: "Identity emerges in the fixation of social selfhood, but objects are not thereby fixed absolutely or forever. Like persons, objects have a social life. They come to be what they are in relation to other things and can be transformed by their experiences" (Hein, 2000, pp. 53-54). Textness: "The meanings at stake need to be interpreted in context, and the immediate context is that of museums themselves as a kind of text: a space which makes meanings, and which can be read (Ravelli, 2006, p. 119). Aestheticness: Now the existence of these satisfactions in the aesthetic experience is a function of the aesthetic field, i.e., of both subject and object, the subject through adopting the aesthetic point of view, the object through being an entity structured in certain ways, the ways being quite numerous and dictated by, among other things, the medium and materials involved, the inventiveness and craftmanship of the creator. The satisfaction is not in one or in the other, it is an outcome of the transaction between the two (Zimmerman, 1966, p. 185). Hein, H. (2000). The museum in transition: A philosophical position. Washington, DC: Smithsonian Institution Press. Ravelli, L. (2006). Museum texts: Communication frameworks. Abingdon, Oxon: Routledge. Waugh, D. (n.d.). Material culture/objects. Center for History and New Media, George Mason University. Available at http://chnm.gmu.edu/worldhistorysources/unpacking/objectsmain.html. Zimmerman, R. L. (1966). Can anything be an aesthetic object? Journal of Aesthetics and Art Criticism, 25(2), 177-186.